There's one less mystery for October 9th. Yes, Google is still having trouble keeping a lid on product news ahead of its October 9th Pixel 3 event. MySmartPrice has posted what look to be images of Google's first Chrome OS tablet, believed to be called the Pixel Slate, and there's clearly more to the story than we saw the first time around. There's a newer (and possibly Pixel Slate-specific) interface than what we saw on Acer's Chromebook Tab 10, for one thing. 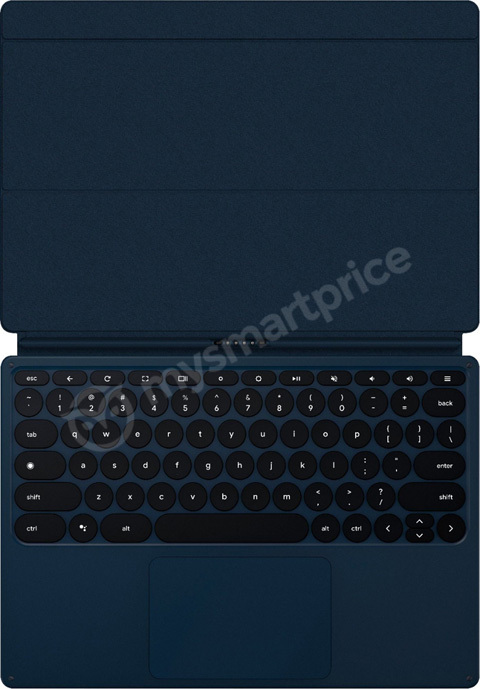 The image also provides a clearer look at how detachable keyboards will work, with a pogo pin connector on one side turning the Slate into a laptop -- and yes, Google would have its own keyboard (below). The leak also shows a relatively thin device with at least one side USB-C port and a fingerprint reader at the top. It would also come in a dark blue shade, conveniently lining up with a similarly-colored Pixelbook Pen that showed up at Google's online store. There are still unknowns, such as the processor, price and ship date. This might not be as premium a machine as the Pixelbook, though. This may be more a showcase for Google's touchscreen developments than a hot rod intended for demanding Chrome OS users.